Ash can't wait to complete the next step of his Pokémon journey. He's determined to win a Z-Ring and learn to do Z-Moves, special attacks that only Trainers who've passed Alola's Island Challenge can use. That means Ash will need to go head-to-head with Hala, the kahuna of Melemele Island. But earning a Z-Ring isn't as simple as just winning a Pokémon battle. First Ash has to prove he's worthy as a Trainer. Does he have what it takes to pass Hala's test? 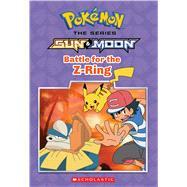 This illustrated chapter book is based on a thrilling three-part Pokémon Sun & Moon episode that can be seen on Disney XD.